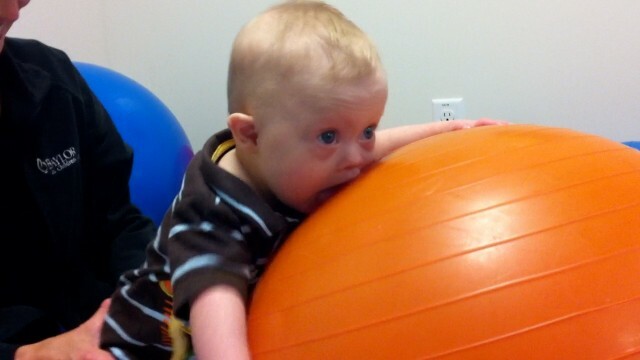 This Kid Makes Physical Therapy Look Like (Very Cute) Child Play! You are here: Home / Therapy / He Makes Physical Therapy Look Like (Very Cute) Child Play! 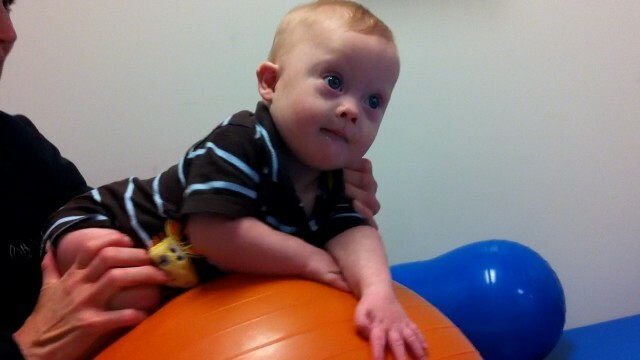 He Makes Physical Therapy Look Like (Very Cute) Child Play! As I was putting together today’s video and thinking about what I was going to write about it, I decided I would just let the video speak for itself. We’ve written about the benefits of treadmill therapy for children born with Down syndrome, some of the best characteristics to look for when choosing a physical therapist for your child, and even what one of the major goals of physical therapy is for a child born with Down syndrome; so I figured today I’d take a second just to brag on my son. While typical children are off doing whatever it is typical children do (Noah’s our first, and only child at this point), Noah’s hard at work developing the strength needed for sitting up, crawling, pulling himself up, and eventually walking. And again, he does this with no complaining. He just wears a cute little grin on his face that’s become his badge of dedication to never giving up. For the 2 millionth time…I love being this little boy’s daddy. As we’ve gotten to know so many families raising children with special needs, we’ve been blown away by all the amazing things their children are doing. Not only in their physiotherapy appointments (as my friends in Australia call it) but in a variety of things. To the parents of children born with any sort of disability reading this; I am amazed at how much you love and sacrifice for your children. You guys spend countless hours helping them reach their milestones, and I wish I could give every one of you a big hug. Thanks for inspiring Abbie and I. We appreciate all of the great ideas we learn from all of you who take the time to share them with us. Even Noah wants to reach out and hug you! Please take a few minutes to brag on your child in the comments below (and perhaps congratulate another parent.) Anything goes. Did they just reach a new milestone? Did they rock it at this week at physical therapy? Was today the day your little one rolled over for the first time? No accomplishment is a small accomplishment, and we encourage you to celebrate every win! So please take a second and brag on your kids in the comments below…we want to hear about! Way to go Reuben! Now it’s time to grab your running shoes because before you know it, you’ll be chasing after him! You got it! Ruben rocks! So proud of all Noah has accomplished! Our Gracie doesn’t self-feed like a two-year-old should, but a recent suggestion by our speech therapist is helping. She eats better with distraction (visual or tactile), but we want to go longer stretches without them. She suggested a dry-erase board with check-off boxes as she eats (a few bites on her own equals a check), and once she’s filled the boxes, we turn the video on or give her a bath book or play music. No tantrums so far! That sounds like a great program. Feel free to share any of your tips with us. Everyone here really likes learning from everyone else! How long has Gracie been in speech therapy? Noah’s almost 14 months old so we are considering getting him involved with a speech therapist. Also, what sort of foods is Gracie eating right now? Sarah (5) has OT, PT, ST/feeding every week. She attends preschool 4 days a week for 3 hours. Then we have school at home for 1-2 hours. She knows her ABC’s, count to 15, colors, shapes, how to spell her name, and so much more. She lives life to the fullest and has taught us so much about unconditional love and cherishing life. Isaac(1) has OT, PT, ST/feeding, and a home educator each week. He can get in a sitting position, crawls short distances, can scoot everywhere, feeds himself, drinks from a straw cup, just started drinking from an open cup, pulls up, stands with support, says momma, dada, bubba, Elijah, baba, baby, no. Isaac means laughter and he loves to giggle and laugh. He brings us so much joy. Elijah is typically developing and at age 8 has such a tender heart. He loves his siblings. He has been recognized at school several times for helping others, especially those with special needs. Our children are blessings from God and have taught us so much. Wow Robyn, it sounds like you have your hands full and are in Mommy heaven! All three are doing so well. You are definitely one dedicated mommy and I bet your children are just crazy about you! I wouldn’t be surprised if Elijah ends up in some sort of medical field. After all he is going through with helping and supporting his brother and sister, he’ll definitely be a pro in helping others! First of all: HOOOOOORAY FOR NOAH! Little Man is just Little Man. We’re working on eating more solid foods. It’s not that he’s having a problem…I’m the one with the problem 🙁 It’s so much easier to control the amount of fat in his diet when he’s on baby food…I’m getting better about it. Ok,twist my arm to brag about Em, lol!! This week she knocked my socks off by signing strawberry when she wanted another one! Not typical of her at all!! She does well when prompted but never asks, by signing, for anything! This was huge!!! And we made sure she knew we were so proud of her! Noah is such a pleasant little trooper!! he really gives it his all. There were some days when Em would not cooperate at all. I’m sure you were happy to give her a strawberry! If James signs something independently, I will do ANYthing I can to get his request filled as fast as I can! Signing is such a great thing. Just this week our genetics doctor recommended that we sign to Enzo. Surprise, surprise, we’ve already started about 4 months ago. He is almost 9 months now. And just a couple of days ago while we were singing the ABC song, we noticed something that was a first…Enzo started moving his hands as if he wanted to join us in signing and singing the song! We were so happy! We look forward to communicating with him sooner than later! Our Brodie (5 mos) works sooooo hard everyday! He and Noah seem so similar and look similar as well. 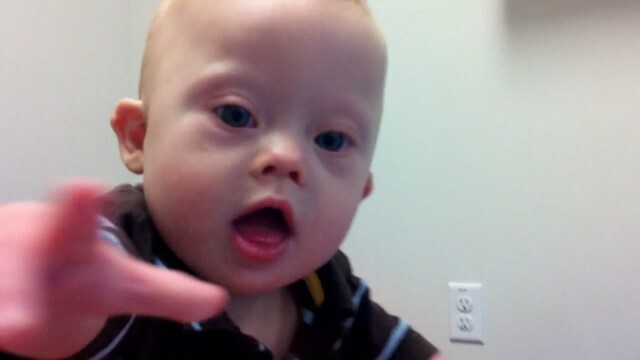 I love watching all of the videos and seeing Noah’s pictures. It helps me take a glance into our future with Brodie. Brodie is trying to sit by himself. He gets stronger every day…and he also does it with a huge smile. Thanks Monica! We really enjoy sharing his stories with everyone…and getting to hear so many wonderful stories! That sitting is a lot of work by the way…it seemed like it took Noah forever to sit. Well I took a cue from you and followed James around therapy the other day with a video camera. Note to self: make sure video camera is charged next time! About to pull off the footage now and see what I got. I love seeing James move! He’s a content little guy, so finding motivation is hard. It’s rare for him to really want to go for something, and I love watching his own version of the inchworm/military crawl. Joshua is now 16 months old. He is reaching every milestone wonderfully so far. I think in a couple months he will be walking. He has been army crawling, can get on all fours to crawl, but the army crawling has become total habit. Pulls up on everything, and taking steps as he holds on. He has mastered all the stairs going up, he does not quite get the going down concept yet. All and all we have been so blessed with great strength and determination in Joshua. Keep up the great work Noah…your doing AWESOME!!! I must say I LOVE reading about everyones children and what they are doing!! The pride that pours out when you read all these stories is enough to make your heart smile!! Our kids are so amazing!!! Now to brag about my Sydney…this weekend Syd had two BIG firsts for us. On Friday I finally got her to drink from a straw. She still isn’t a big fan of it, but she did it!! I was so excited!!! Then on Saturday she climbed up a full flight of stairs. We don’t have stairs at our house, so while visiting friends I wanted to see if she could. I don’t know whose smile was bigger…hers or mine!!! I love how excited Sydney gets when she does something new. Every day this little girl amazes me more and more. She makes every single day better than the last. I am so lucky to have her and my other two awesome kiddos!!!! There is just not enough time in the day to express how much I agree with you. We love love love reading about all the different children and adults out there that are making life so beautiful. It just goes to show how far a person and persons can go when there is a person filled with love by their side. Congrats on Sydney’s recent accomplishment! We know you must be super proud! Dax is rocking the big therapy ball here on the East coast 😉 I’m happy to brag that after months of army crawling, he has been crawling up on all fours! He doesn’t go more than 3 or 4 “steps” because the army crawl is sooo much faster, but it’s like I can see the wheels turning in his head as he is making those connections in his brain. So exciting! baby Liam is working on head control now. I am excited that Andrew is using a little bit of sign language…more, eat, milk…and is feeding himself diced foods. But he’s still working on learning to crawl/walk…gotta get him motivated! I know the world will open up to him more once he becomes mobile! Our baby Lily was born one week ago today at 36 weeks. We are proud to say that even with DS and a VSD she spent three short days in the NICU and came home with us weighing in at 4lbs 10oz. She’s breast feeding like a champ and has already gained back the weight she lost since the hospital. We never expected her to be home yet much less feeding with such ease. I guess she didn’t get the memo about the challenges she would be facing because she’s thriving and making us so proud already!!! So thrilled to see all the wonderful things everyone’s kids are doing!!! PJ is now sitting up really well on his own. We’re still working on shoulder strength which is hard for him. He doesn’t like to be on his tummy because his colostomy bag has a big hard plastic ring on it. But that should be getting reversed on Leap Day!!! I am so in love with my little boy, I can’t imagine him not being a part of my family!!! Well this week (heck, every day) we have something new that we discover about our little Enzo. Enzo rocked OT, ST, and PT this week. He had not been eating solids for about 2 weeks and then today he started eating his purees again like there was no tomorrow. HE loves it when when we sing to him and you can see in his eyes and his mouth that he wants to join in. Enzo sits up better and better and has even learned to scooch around. I’ll put him down in one position and the next thing you know he ends up facing a different way! He’s so smart. He is so eager to get going and get things done. What a trooper! There are so many things that he is doing now, I can’t keep up. In fact, I have to start writing certain things down so I can remember to tell his therapists and doctors! They are all so pleased. And the best part…the three of us get to “play” with each other more! Ssshhhhhh! Don’t tell Enzo this is THERAPY! He thinks it’s all play and so do we! HA! Claire reached a new milestone today! She climbed onto the couch by herself for the 1st time! Ed and I think that it will be soon before she is walking on her own! We cannot wait! It’s funny, with my 4 yr old, he sat, then he crawled, then he cruised, then he walked. and we cheered him on the whole way. With Colton, he pushed up on tummy time, then he learned how to play with his toys, then he figured out how to get on his side, then he sat up, then he leaned forward and got himself back up, then he sat some more, then he(finally) rolled, then he figured out how to get onto his hands and knees… and all the minute details in between. And we cheer him the whole way. He is most recently transitioning between sit and quad and crawling backwards. I think he is frustrated… he crawls backwards, can’t figure out why he’s not getting to where he wants to go and then sits up farther than where he was.